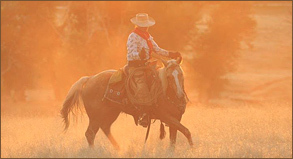 An all-inclusive, upscale riding, horsemanship and working cattle guest ranch. 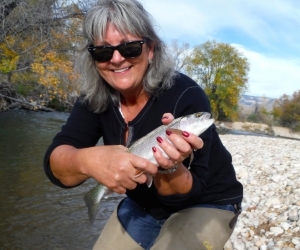 The Hideout Lodge & Guest Ranch is located in beautiful Shell, Wyoming.Shell is located east of Cody and Yellowstone National Park. With a backyard of 650,000 acres in an area with tremendous diversity of scenery and altitudes ranging from 4,200 to 13,100 feet, you will seldom see the same trail twice. The Hideout is limited to approximately 25 riders weekly and 130 horses. We take pride in offering a very personal, fun and safe riding experience. 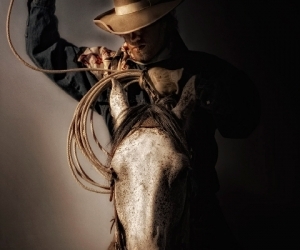 The Hideout is focused on horseback riding, horsemanship and working cattle. 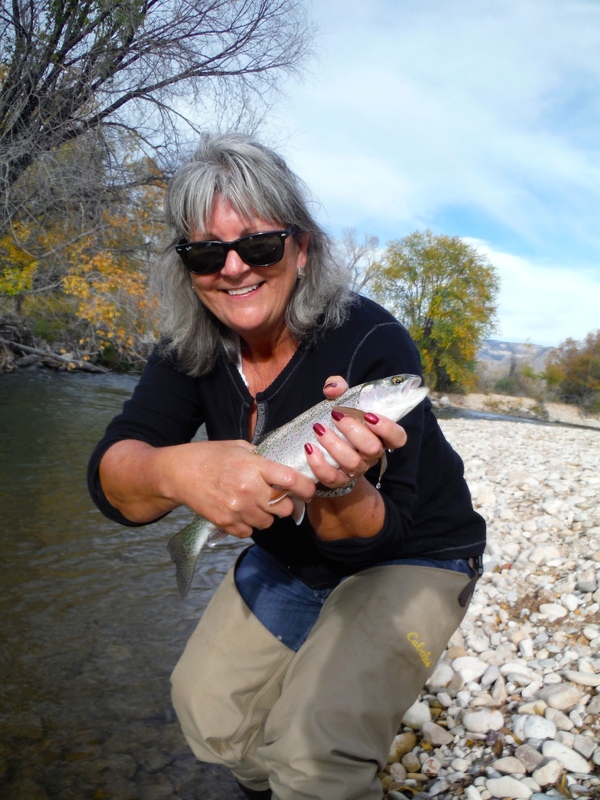 We do offer other activities to provide a break from the saddle including fly-fishing, trapshooting, archery, scenic 4x4 driving tours, Cody Nite Rodeo (seasonal), hiking, a hot tub and a gorgeous lap pool. We are a team of passionate and diverse professionals who deeply care about your vacation and well-being. We are committed to the highest standards of culinary experience, quality lodging, attentive staff, and responsive horses. Our owners and staff are multi-cultural and view diversity as an asset. We also welcome a growing number of international travelers each week. The Hideout: Adventures in and out of the Saddle! From the Hideout Kitchen to Yours! We are proud that when it comes to horses, hospitality, safety and creating a unique and exciting vacation, we have the loyal staff and outside partners to accomplish it. While we operate our guest season from late March through early November, this team continues to work when the ranch gates are closed to our guests. The results are what make your experience at The Hideout so special. Our kernel staff are employed year-round here. This team guides and assures a great vacation to all our Hideout Guests. They recruit, hire and train our seasonal teams season after season. We are the year-around barn management team responsible for everything related to horses, barn staff, training, activities, cattle work, clinics, care of horses, record-keeping, cleaning and organizing and just about anything else you can think of! We recruit, hire and train the new wranglers in all areas important to run a worry-free, safe and enjoyable vacation with regard to horseback riding and other activities we offer. Off-season, we work with new horses, keep riding the rest of the herd and take lessons ourselves to constantly improve and fine-tune our own skills to our benefit, as well as that of our guests, our seasonal staff and our horses. We all continue to look for ways to improve your horsemanship and riding experience at The Hideout. Further on this page you can read more about Marijn and Tom. Marijn is one of our Hideout owners and the wife of General Manager, Peter De Cabooter. Marijn’s introduction to riding and horsemanship started in 2007 when she moved to Wyoming together with Peter and their boys, Edward and Victor. Although she loves outdoor sports like skiing, waterskiing, sailing and especially swimming, she also enjoys the comforts and amenities of city life. Initially, she was intimidated and even scared of horses and not really the ranch girl used to handle horses, cattle and trucks pulling horse trailers! From day one moving to Shell, she started to spend time with horses, learn about them and learn from her mistakes. For the last several years now, she has spent between five and eight hours a day in the saddle for eight months a year. She now loves trail riding l, working cattle and learning from the pros or whomever has something to impart. Marijn spend several years working and riding daily alongside Vaquero and Cowboy Ramon Castro, The Hideout’s and Flitner Ranch horse trainer in addition to learning from and observing other great riders and instructors visiting The Hideout. During her free time, she continues to study horses and horsemanship watching DVD’s, looking up information on the internet and indulging in any formal and practical learnings available. 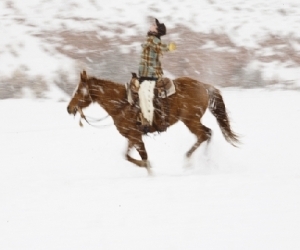 She works long hours with her horses, year-round. 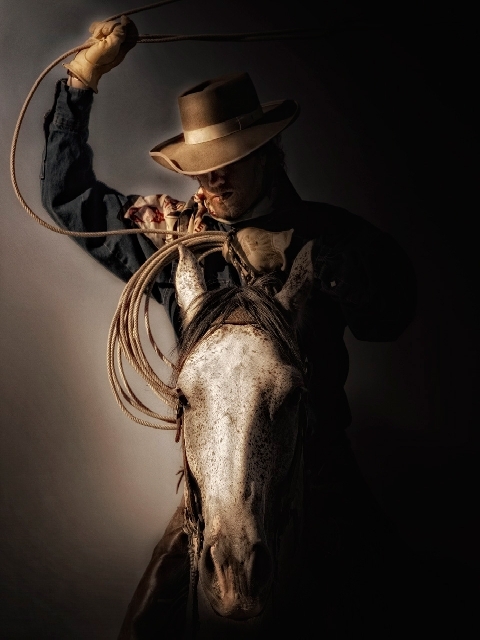 Throughout the guest season Marijn spends 6 to 8 hours in the saddle daily, taking guests out on cattle work, trail rides and teaching the basics of horsemanship, liberty and free style. Marijn is currently working towards a Parelli Level 4 degree in horsemanship. Marijn has a calm, but firm personality, and many riders enjoy her company as she is careful and does not take risks when it comes to safety. With the long journey in horsemanship fresh in mind and continuing this journey, she will always give credit to those she learned from. At the same time, she will hold anybody accountable to deliver on what they claim to be. If you are interested to learn more, she will generously share her knowledge and learnings in addition to her frustrations! Being a Parelli Level 3 working towards Level 4, Marijn can teach you the basics of The Parelli 7 Games and will assist in higher level clinics given by certified trainers at The Hideout during dedicated clinic weeks. Those guests who are interested can spend an afternoon playing & working with her and her horses online and learning the basics of liberty work. Tom is our head wrangler. He grew up on a ranch in Arkansas and was on and around horses since before he could walk. Tom is retired from the U. S. Army and spent many years overseas learning about different cultures and traveling to interesting and often remote areas of the world. Tom and his wife, Rebecca, and two boys, Augustus and Seamus, vacationed at The Hideout three times as guests themselves. He looks the part, is well-organized and disciplined and keeps everybody safe in this big country. Together with Marijn and the Wranglers, he is your guardian angel out there. His feel for orientation and navigation are exceptional, which is an indispensable asset given the terrain and vast area we ride in. His long-time background around horses from working in sale barns, guiding trail rides, and having his own horse gave him a wealth of knowledge about horses, how to take care of them, ride, stay safe on them and keep them sound and healthy. Tom also worked with and continues to learn from Ramon Castro, our horse trainer, our visiting trainers Parelli 4 Star Trainer Amie Bowers, Parelli 3 Star Trainer Farrah Green, and other pros. He earned his Parelli Level 2 Certificate and is working towards his Parelli Level 3 Certificate. Tom is The Hideout’s point of contact with The Flitner Ranch Cattle Operation to plan the weekly cattle work for the ranch with the guests. Tom and Marijn also work closely with Ramon Castro on this. Every week on Wednesday, our guests can attend Tom’s horsemanship clinic in which he introduces our guests to the basics of AH Horsemanship. He presents this hands-on class in a clear and understandable way to the participants. Tom is an excellent, clear and to-the-point instructor as you will find out when you attend one of his clinics. He comes with a no-nonsense, straightforward personality supported by a golden heart that cares. Tom got to know The Hideout from an advertisement played many years ago, during the Super Bowl and had wanted to visit The Hideout ever since. He often jokes that “a dream can come true”. A big bonus is that Tom is great bagpipe player! Every year we hire around eight wranglers. Some of them have returned several seasons, while others are new. 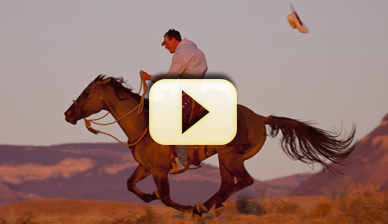 Some wranglers stay throughout the season, while others stay for two or three months. All wranglers must be at least 21 years old, and they all need to have a clean driver’s license. To maximize use of our 650,000 acres back yard, we trailer out for most of our rides. We have both female and male wranglers, some who have a Western riding background, some who have a formal English riding background and training, and some who ride or have ridden both disciplines. 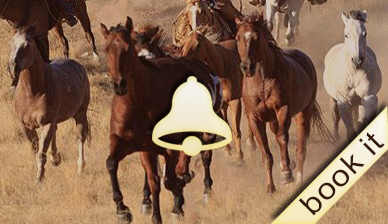 We have wranglers who have worked both in the US and abroad and most of them are excellent riding instructors. We hire for Character, Conduct and Competence and look for people with horse- as well as people-skills and a strong work ethic. Because we embrace loyalty, diversity, continuity and reliability, we have a team of outside professionals working with us. They are as much part of our team as our own crew. 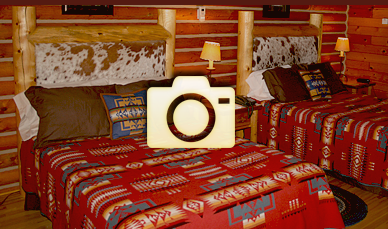 As you might meet them during your vacation at The Hideout, we would like to introduce you to them as well. These pros challenge us and keep us on our toes when it comes to learning and understanding new market trends..
Ramon Castro is our horse trainer and farrier. He shoes all our horses. Every horse that comes in to the herd goes through his hands to have an outside expert opinion. Starting with ground work, working with the feet of the horses and working on lightness, our goal is to bring consistency and predictability to our horse program. In addition to the training the new seasonal wranglers get from Tom and Marijn, all wranglers need to learn the basics and the process of how Ramon trains our horses. Consistency is vital as it makes it easier on our horses, which translates into happier and safer horses, resulting in more docile horses for our guests to ride. Although Ramon has a natural talent for horses, riding and horsemanship, he also benefitted from training and clinics from Curt Pate, Brian Neubert, Buck Branneman and others. He is a perennial student of horses. Ramon has participated several times for The Hideout in The Extreme Mustang Makeover and Supreme Extreme Mustang Makeover. 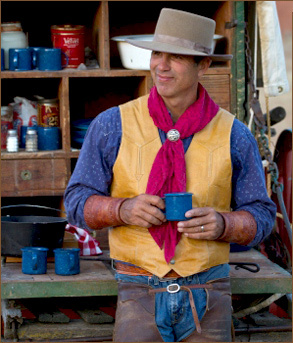 Aside from his work at The Hideout, Ramon is the cow-boss and horse trainer at The Flitner Ranch, our sister company. 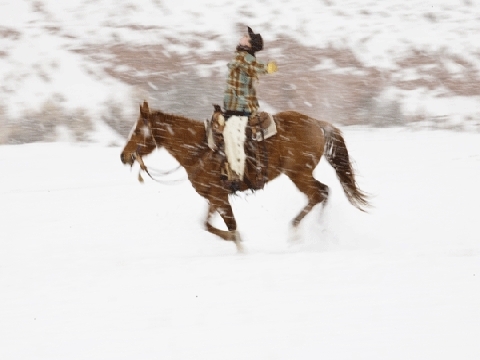 Farrah Green, a Parelli 3 Start trained lives in Cody. Farrah is also a classic dressage trainer and Western rider. As of the 2017 Season, all our incoming new wranglers will have the privilege of attending one or more clinics with Farrah Green. Amie Bowers is an Eventing Rider and Parelli Level 4 Star Instructor hailing from California, currently living with her husband, Nate, on Bowers Farm in Ft. Collins, Colorado. The goal of our AH Horsemanship program is to continue to improve ourselves and learn from the experts. Over the years many different trainers have worked with our crew to help us in our journey of quality horsemanship. During our off-season, you can sign up for dedicated clinics at The Hideout. Please contact info@thehideout.com for clinic dates.